Pet keeper, Marc Morrone, was nearly murdered in his home by Smiley the monkey. Emily the python nearly strangled him to death in his pet store. And a wild porcupine chase through an airport hangar left him covered in quills. Such are the adventures of an intrepid (dare I say revolutionary) pet expert with an unyielding passion for animals – even the ones who may sometimes misunderstand his intentions! Trust me, Indiana Jones has nothing on this guy! We, of course, know Marc through his multiple appearances on the Martha Stewart Living television program and the Martha Stewart Show over the years, not to mention his spots on Martha Stewart Living Satellite Radio and on various other television and radio programs. He has become the pet expert, unrivalled in his knowledge of the art of keeping our pets happy and healthy. 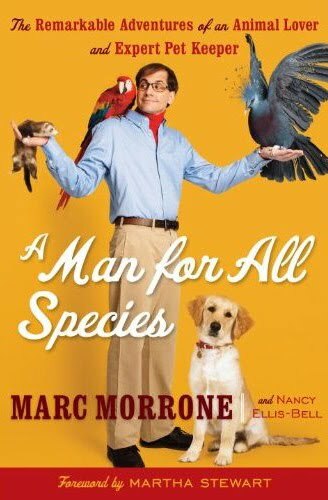 His new book, out on March 23rd, is called “A Man For All Species”, and he is indeed that. From birds to reptiles to insects, to all manner of mammals and marsupials, he has become the go-to source for anyone with questions or concerns about how to raise their pets. The book is a marvellous read! As an animal lover myself, I could not put it down. Throughout most of it I felt as if I could actually hear Marc’s voice articulating the words. The tone is conversational and informal, filled with hilarious and fascinating anecdotes about his adventures in petkeeping, from his childhood days to the present, populated with all kinds of characters and creatures along the way. While the style may be casual and humorous, the content is rich with information and overflowing with knowledge. There is a chapter, for instance, on kosher pet care! Marc has become more or less the only pet expert in America who has studied kosher pet keeping methods, including which animals are not considered kosher pets, what to do with your pets on Jewish holidays and how to feed pets in a way that does not violate kosher house rules. Marc explores it in detail and it’s truly fascinating! Marc has had many animal adventures over the years. Several stand out as highlights, including the aforementioned altercations with some of his antagonistic lodgers! Others are more touching, but all of them are engaging and reflective of a man with a deep passion for what he does and the animals he raises. It was a passion that began in his childhood when Marc’s parents encouraged him to keep all manner of found animals on their front porch and in their basement, in little aquariums and cages, from turtles to insects to birds. Marc and Martha pose on the set of her television studio with two of their favourite birds. Coral Ann, Martha's favourite cockatiel, resides at Marc's pet store, but she is clearly 'Martha's bird' and she is not for sale. Harry, on Marc's shoulder, will not interact with any human other than Marc - a strong bond of friendship forged over many years. Two of Martha's kittens are added to the mix. It was that same passion that led Martha Stewart to call him up one morning after watching him on television. Struck by the wide assortment of animals Marc had with him, all cavorting happily together on camera, she was also in awe of his knowledge. 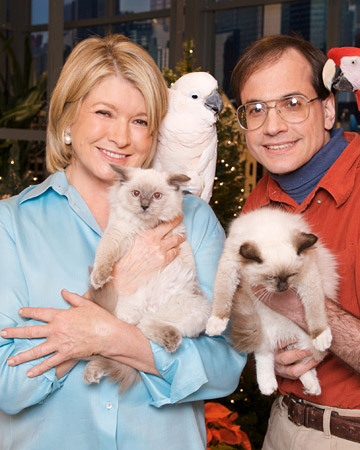 It wasn’t long before Martha had him on her show and quickly made him into the resident pet expert for Martha Stewart Living Omnimedia. In speaking with Marc these last couple of months, I’ve come to understand just how much he adores Martha, who writes the foreword to this book. There is an entire section of the book devoted to Martha and his work with her, something he is very, very proud of. Marc went to Martha’s trial in 2004, rarely missing an opportunity to support her in her difficult time, and really impressed upon me how wonderful she has been to him. Marc even broke one of his hallmark rules for Martha: eating lunch. Marc never eats lunch. Not only does he not have time, he is just not that keen on midday munching. But one day Martha insisted on taking him to lunch on her way to Lily Pond Lane and Marc took her to his friend’s diner. By Marc’s own admission, the food was terrible that day but Martha happily ate her lunch, all the while sharing stories and planning more shows with Marc, demonstrating an elegance and focus he has admired in her for years. There are tales of Martha’s pets, too, and plenty of memories of the segments he did with Martha on her television programs – the good, the bad and the ugly! You’ll learn about the animal export/import business in America (something Marc is an expert in and something I knew very little about) and hear all about his famous store, Parrots of the World, which Marc boasts is the cleanest pet store in the world. Most of all, you will be entertained in a fun and informative way. You will definitely learn something from this book and you will come to adore Marc, whose passion for what he does shines on every single page. UPDATE: Marc just informed me that he will have a half-hour show of his own on Hallmark starting next fall called Petkeeping, part of the new roster of shows being developed by MSLO for the cable channel.